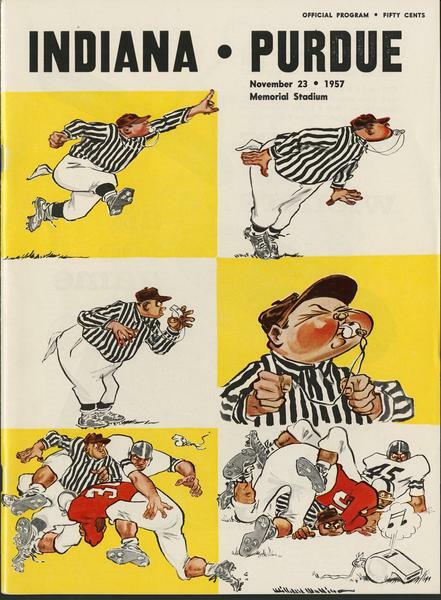 A selection of Indiana University football programs from the 1920s through the 1970s. 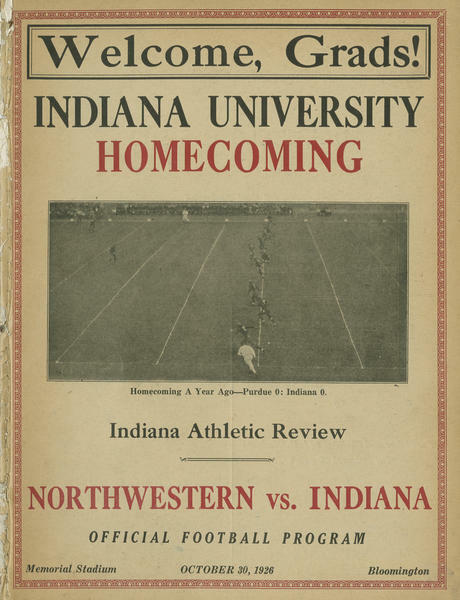 In the early days of the football program, the Indiana Athletic Review served as a source for team news and gameday information. Some programs feature the work of commercial artist C. C. Beall, who illustrated for national magazines like the Saturday Evening Post and Collier's. Another artist featured is Henry Alonzo "Lon" Keller, a sports artist who also designed the New York Yankees "top hat" logo. 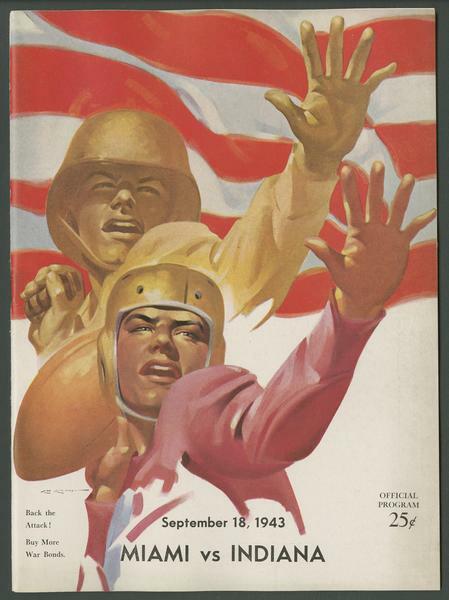 Football programs created during World War II served a dual purpose--to keep sports fans apprised of facts and statistics pertinent to that day's game, and also to appeal to citizens to back the war effort through buying war bonds and stamps. 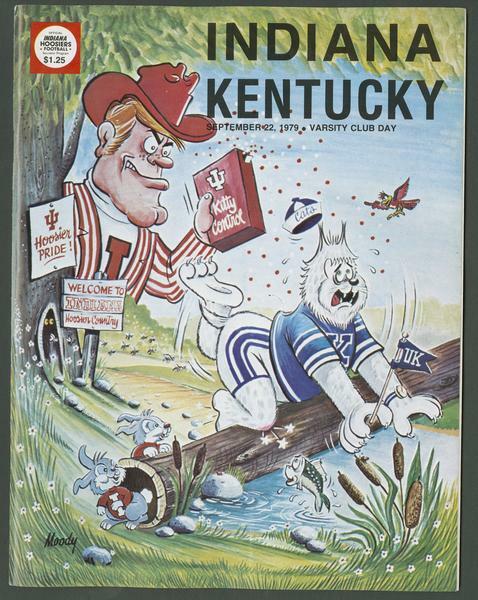 And not to be missed are the covers that capture classic IU rivalries with Purdue and Kentucky. 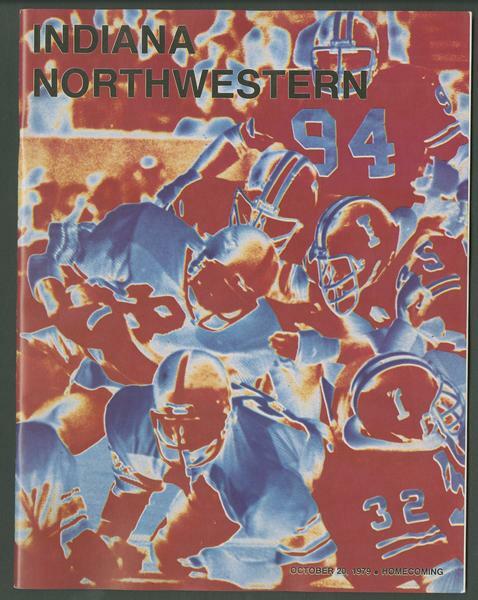 To see more football program covers, search the Archives Photograph Collection. To view entire programs, contact the University Archives. Program cover gallery curated by Anna Lucas. "Welcome, Grads! Indiana University Homecoming. Northwestern vs. Indiana. 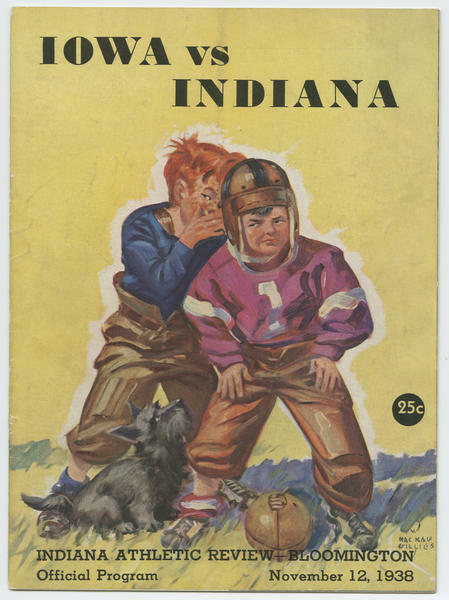 Indiana Athletic Review. 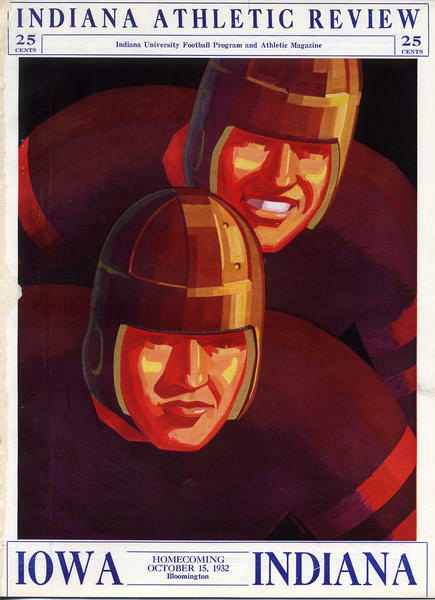 Official football program. Memorial Stadium. October 30, 1926. Bloomington. Homecoming a year ago - Purdue 0; Indiana 0." "Iowa - Indiana. 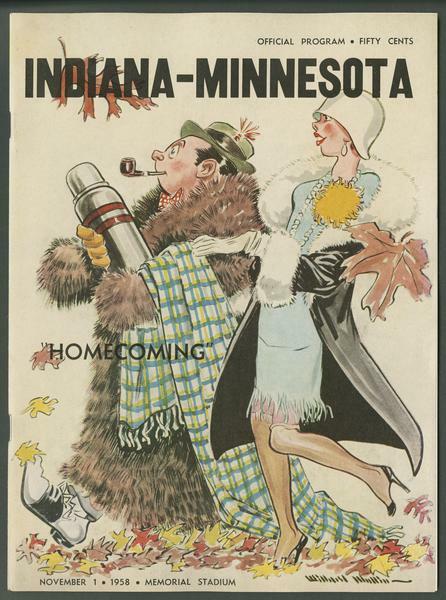 Homecoming, October 15, 1932, Bloomington. 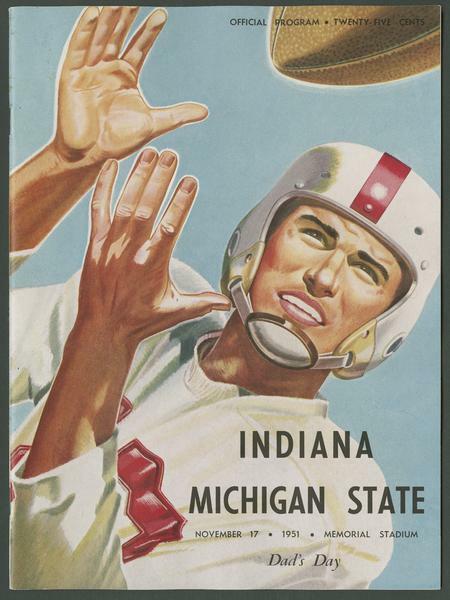 Indiana Athletic Review: Indiana University Football Program and Athletic Magazine. 25 cents." "Indiana vs. Ohio State. Oct. 26, 1935. Bloomington. Homecoming. 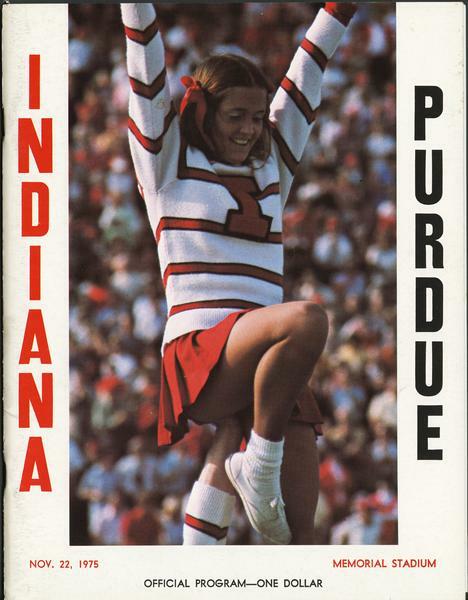 Indiana Athletic Review, 25 cents." 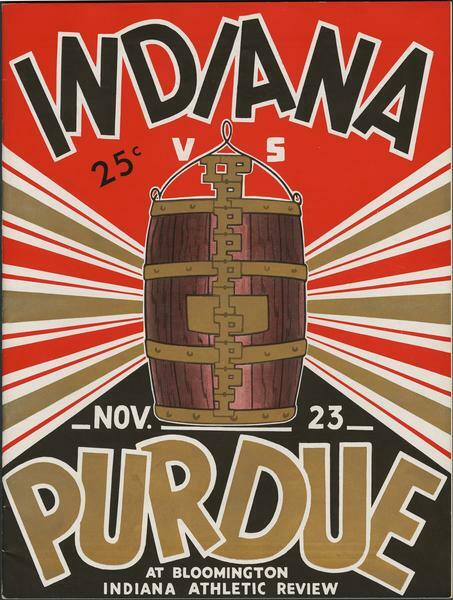 "Indiana vs Purdue. Nov. 23. At Bloomington. Indiana Athletic Review. 25 cents." "Butler vs Indiana. September 26, 1942. 'Buy war stamps and bonds.' Official program, 25 cents." Artist's signature: Lon Keller. "Miami vs Indiana. September 18, 1943. Back the attack! Buy more war bonds. Official program, 25 cents." Artist's signature: Lon Keller. "Indiana - Michigan State. Dad's Day. November 17, 1951. Memorial Stadium. 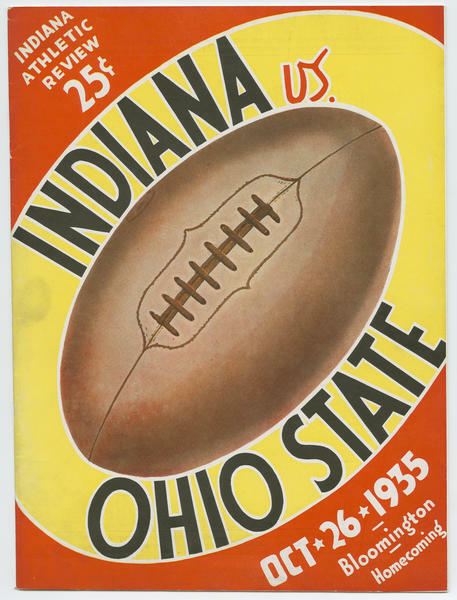 Official Program, twenty-five cents." 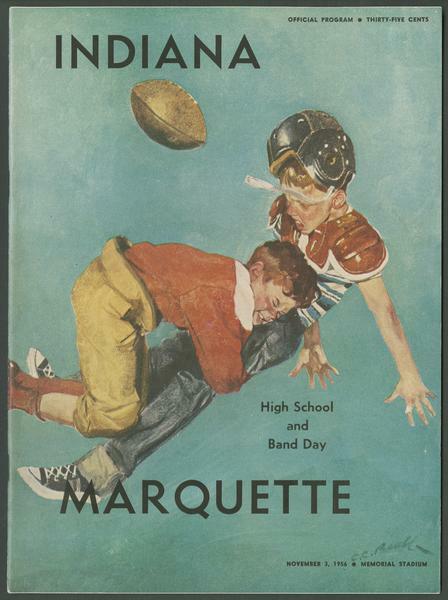 "Indiana - Marquette. High School and Band Day. November 3, 1956. Memorial Stadium. 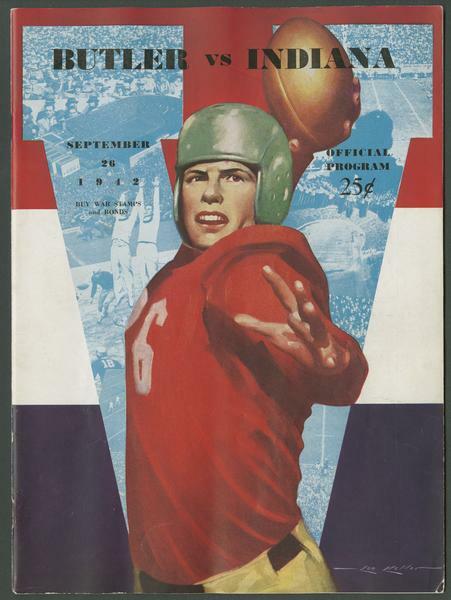 Official program, thirty-five cents." Artist's signature: C.C. Beall. "Indiana - Purdue. November 23, 1957. Memorial Stadium. Official program, fifty cents." Artist's signature: Willard Mullin. "Indiana - Minnesota. 'Homecoming.' November 1, 1958. Memorial Stadium. Official program, fifty cents." Artist's signature: Willard Mullin. "Indiana vs Cincinnati. October 26, 1963. High School and Band Day. I.U. Stadium. Official Program, 50 cents." Artist's signature: Joe Little. 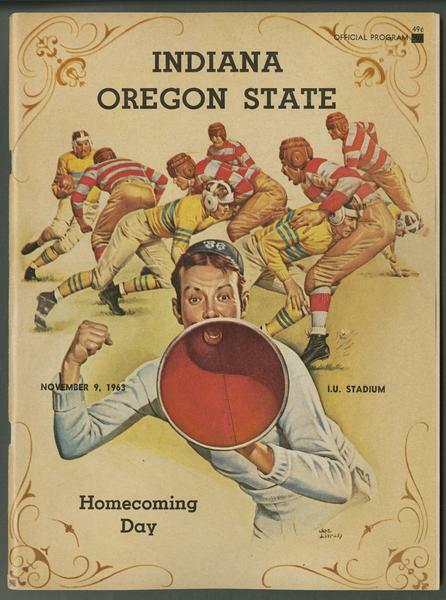 "Indiana - Oregon State. Homecoming Day. November 9, 1963. I.U. Stadium. 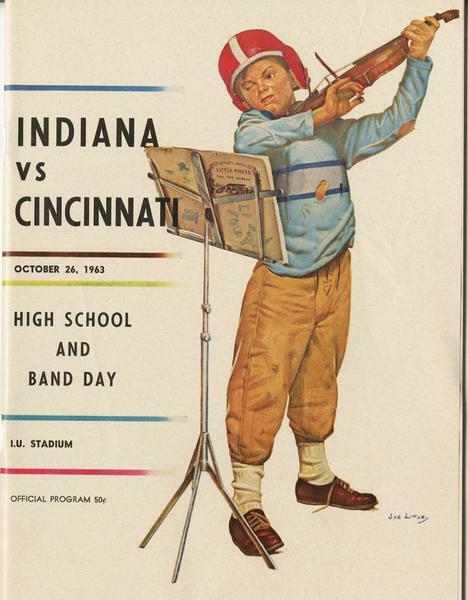 Official program, 49 cents." Artist's signature: Joe Little. "Indiana - Purdue. Nov. 22, 1975. Memorial Stadium. Official Program - One Dollar." "Indiana - Kentucky. September 22, 1979. Varsity Club Day." Artist's signature: Moody. "Indiana - Northwestern. October 20, 1979. Homecoming." "Iowa vs Indiana. Indiana Athletic Review - Bloomington. Official Program. November 12, 1938. Mac Rae Gillies (artist). 25 cents."